5-HTP also known as 5-Hydroxytryptophan is produced by the body from the Amino Acid Tryptophan. It aids in the production hormones Serotonin and Melatonin. While Melatonin is a natural sleep inducer, Serotonin works as a natural antidepressant within the body. Manufactured from an African plant and sold in supplement format, 5-HTP is sold in health food stores and taken for a variety of reasons, below we have listed six health benefits a person might experience while taking 5-HTP. That uncontrollable dread, an inability to deal with the moment you are in, sweating, fast heart rate, difficulty breathing and a sudden need to get away can be some of the ways a person who suffers from anxiety might describe how they feel. Anxiety can be a severe mental illness from over worry or fear that sometimes needs to be treated by a doctor. From trauma and stress to OCD and general anxiety, 5-HTP can decrease anxiety and promote relaxation which is a much-needed commodity for those who suffer. That throbbing headache that disturbs the whole equilibrium of our bodies from ears to eyes to the stomach and beyond can potentially be reduced in frequency by taking 5-HTP. There have been and continue to study citing a potential low level of Serotonin in the body that triggers this type of a headache. Taking 5-HTP on a regular basis may decrease the number of headaches a person gets. A well-studied and documented treatment for depression, 5-HTP can potentially outperform anti-depressants and other clinical substances that often come with a variety of unwanted side effects. By increasing, Serotonin levels within the body 5-HTP can promote better mode and enhance the mental and emotional state of individuals suffering from mild depression. We all like to think we could better ourselves, lose a few pounds here or there. Studies show that 5-HTP can increase a person feeling of fullness which would aid them in eating less, especially at the dessert table in our case. When a person begins a weight loss program it can be a double-edged sword; the weight loss makes you hungrier which can thwart your efforts. By taking 5-HTP, you can sidestep this side effect of your weight loss efforts. Certain chronic conditions can wreak havoc on our bodies as if it isn’t enough to deal with a chronic illness. Taking 5-HTP with certain conditions like Fibromyalgia can assist in easing the symptoms of pain and weakness that can ravage your body from this illness. If we can lessen or weaken the symptoms of chronic illness, it can remove some of the strain on our bodies. Clinical trials have been performed on diabetic who were overweight but given no diet limitations. During these trials the patients on 5-HTP took in fewer carbohydrates, calories, and fat which in turn promoted better weight management and blood sugar maintenance, providing better overall health. The validity of your 5-HTP source is highly important to prevent contamination issues and always consult a physician before taking this supplement because in-depth research hasn’t been performed for potential side effects a person might suffer. 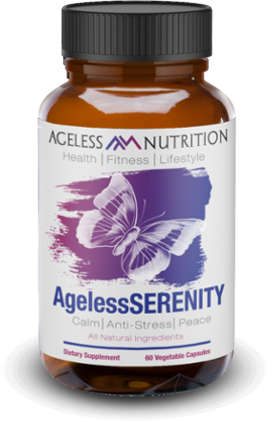 You can find this wonderful, natural healing ingredient in two of our premium health supplements, AgelessSLEEP and AgelessSERENITY. These supplements focus on relaxation and improving the sleep cycle of those who need a better rest. 5-HTP plays an important role in our unique formulas that are all designed and manufactured right here in the USA. With a 60-day money back guarantee, we know that you will be more than happy with our supplements and the results you see within 30 days!